Twelve albums have been shortlisted for the prestigious Northern Ireland Music Prize with the winner to be announced at a special awards night at Belfast’s Mandela Hall on November 11. More than 70 judges from the local music industry were invited to cast their votes for the best Northern Irish album of the last 12 months. 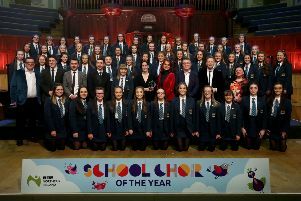 The 12-strong shortlist will be whittled down with a second round of voting before the final award presentation and concert in November. The awards ceremony will mark the culmination of the Sound of Belfast festival programme. The shortlisted acts are: Arborist for the album Home Burial, Arvo Party for album Arvo Party, Bap Kennedy for Reckless Heart, The Divine Comedy for Foreverland, Gross Net for Quantitative Easing, Hannah Peel for Awake But Always Dreaming, Invaderband for Invaderband, Joshua Burnside for Ephrata, Malojian for This Is Nowhere, Our Krypton Son for Fleas & Diamonds, Robocobra Quartet with Music For All Occasions, and Sea Pinks for album Watercourse. Previous winners of the accolade are Ciaran Lavery for album Let Bad In, SOAK for Before We Forgot How To Dream, Robyn G Shiels for album The Blood Of The Innocents, and Foy Vance for Joy of Nothing. The evening will end with the presentation of the Oh Yeah Legend Award to Co Belfast- born Def Leppard guitarist Vivian Campbell who will then take to the stage for a full live performance with new band Last in Line. Visit www.ohyeahcentre.eventbrite.com for more information.